Half of consumers will pick up the phone and make a call or visit a Law Firm in person the same day they perform a local search online. That means when a prospective client wants to find a Lawyer, select a Law Firm, or get more information about your service offerings, they’re often ready to click on a link, contact you, and learn more that day. Google did a survey in 2014 that revealed that fact as well as the staggering statistic that 4 out of 5 consumers want search ads to be customized to their area. People use their mobile phones to conduct research and direct them to Law Firms every single day. The key to capturing more of that local, ready-to-buy traffic for your business is to use a hyper-specific form of Search Engine Optimization (SEO) called Local SEO. This strategy is bit more complex than simply listing your business in every “yellow pages” type of directory. However, it all comes back to the basic principle we promote here at Gorilla Webtactics: Be helpful to your customers. Local SEO means thinking about how your ideal client would search for you and what information he or she needs to know. If you stop at just your name and address, you’re missing the opportunity to truly help your customer make a buying decision. Want to know how you can help your local prospects find their way to your front door? Then get your hands on our free Digital Marketing Strategy Guide right now. 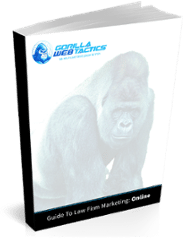 Inside, you’ll discover the method that gives you the most bang for your Local SEO buck —plus seven more hyper-specific secrets to online marketing in the simple, no-nonsense language you’ve come to expect from Gorilla Webtactics.